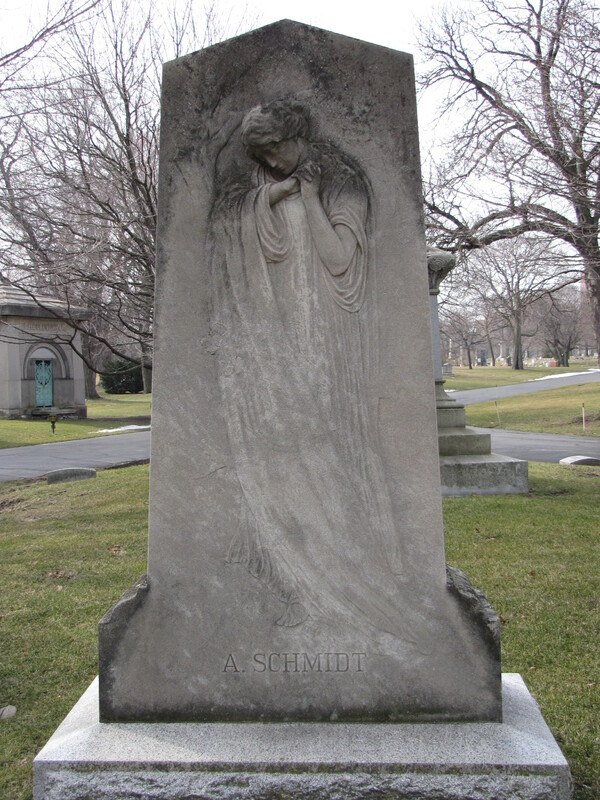 The monument marking the graves of Adolf (1865-1941) and Frieda (1869-1936) Schmidt is a stele (a stone or wooden slab generally taller than it is wide and designed as a funeral commemorative). The limestone monument in the Graceland Cemetery at Chicago, Illinois, is adorned with a mourning figure that is carved into the limestone. The mourning figure’s head is bent in sorrow and she is clasping her hands together, a display of contemplation and grief. The bas-relief is very lightly carved at the base with the features of the figure becoming more three dimentional at the face and shoulders giving the sculpture a ghost-like quality. The gray skies and the barren winter trees heightened the somber mood of the sculpture.